Getting around town with a buggy, 2 little boys, and all the related paraphenalia can be challenging. Most of the time I walk, it takes longer, but I enjoy the journey as much as anything. Today though, we took the bus. 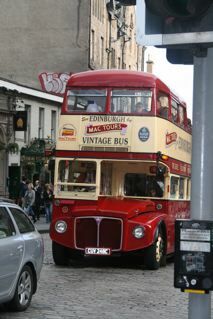 Buses in Edinburgh are regular, frequent, clean and go just about anywhere you need to go (plus the littlies are free). There are some things, some little rules that make them….. well annoying. Things you’re better off knowing before you huddle under a bus stop waiting for one. Firstly you require the exact change. The Lothian bus drivers do not handle money, if you take a five quid note on board, that is how much your ticket will cost. There can only be one unfolded buggy on board at a time. This means if your bus comes past and there is already one on board, you have to fold up or wait for the next bus. Although I can understand the logic, (over crowding etc) the whole process is very annoying. …Because little people and moving buses generally don’t mix we wait until the bus is completely stopped before we try to head for the door. I pressed the button, yelled to D at the back of the bus that “The next stop is ours” and waited….. The bus slowed… drifted towards the footpath and then accelerated again… What? …This guy really wasn’t having a good day! I stood up then, just to make sure he stopped at the next one! You can also purchase weekly, monthly and annual tickets too, which is a great idea if you have to catch 3 or more buses in a day. Do you have any public transport stories? This entry was posted in Days Out and tagged Transport. Bookmark the permalink.